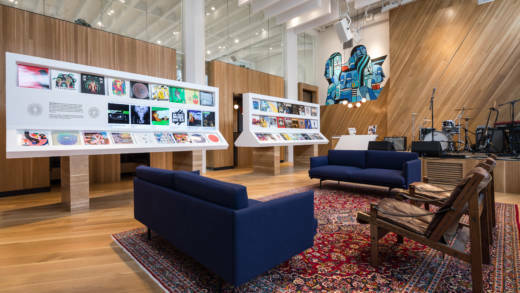 The first thing visitors encounter at the new Oakland offices for Bandcamp, the popular music streaming and merchandise platform, is a rotating display of 99 vinyl LPs, each cover shown outward. A digital screen embedded in one row shows more album art in a running live feed of global online sales. In nooks lining the room are listening stations featuring loveseats and turntables, and in one corner there’s a low stage that, on a recent visit, featured a full rock instrument backline. This is Bandcamp’s record store, to be open Monday-Friday in a room that doubles as a small live music venue. 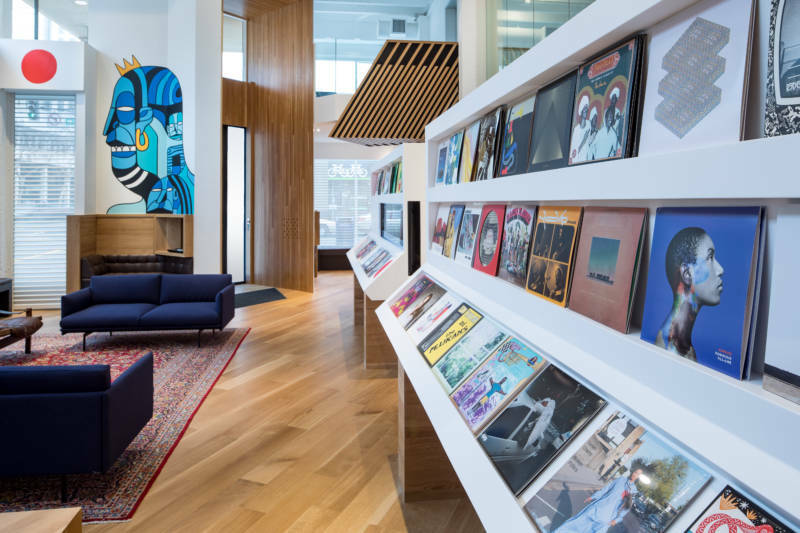 It’s attached to the first permanent office for Bandcamp, a company considered an artist-friendly alternative to streaming services such as Spotify combined with a marketplace for physical goods, and it’s Oakland’s highest-profile music industry arrival in more than a decade. Although the Bay Area is home to a Spotify office as well as the headquarters of webcaster Pandora (which is shifting its workforce towards Atlanta), the streaming companies are viewed locally as closer to tech than the music industry. (Not to mention Apple and Google, which also offer streaming platforms.) Bandcamp has plenty of engineers and Silicon Valley ties, but the company is eager to align itself with local music. Kim described the public-facing aspects of the multipurpose space as an expression of Bandcamp’s artist-first mission. 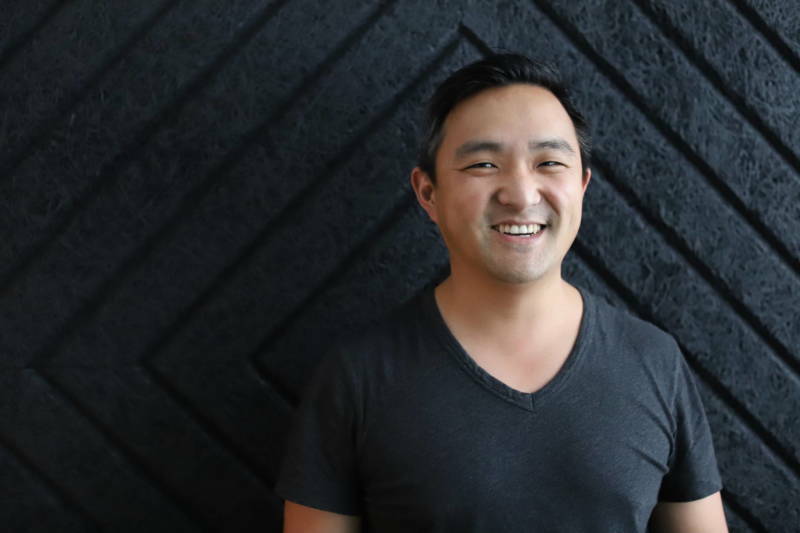 Although the company’s 63 employees will remain distributed around the world, Kim said, 17 of them are expected to regularly work out of the 5,000-square-foot office on the corner of 19th Street and Broadway, which Bandcamp has leased for up to 15 years. Of the company’s 12 hires in the past 12 months, three were specific to running the shop and venue. One of them is Sarah Sexton, founder of the fest and label Oakland Indie Mayhem, who Bandcamp hired to manage the shop and venue. 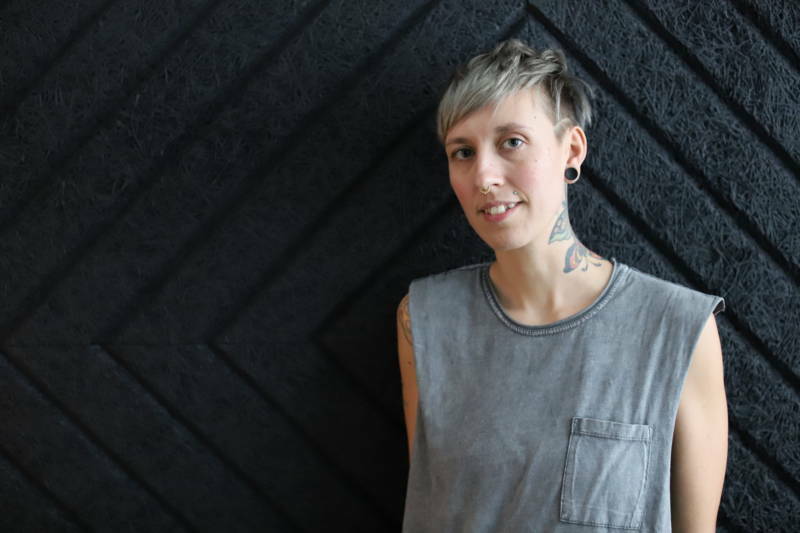 Working under her is Max Gibson, founder of the website and party outfit Wine & Bowties, and DJ Miguel Reyes. Sexton said the shows will be weekly and generally free, with local and touring acts, and will be recorded for a video series. “We want the space to be accessible,” she said, noting the shows will be all-ages and often benefiting local nonprofits. The benefit shows will likely continue the company's progressive record. In what it described as a gesture of solidarity with immigrants, Bandcamp donated its cut of sales from a 24-hour period to the American Civil Liberties Union in early 2017. The company has since fundraised for the Transgender Law Center and the Voting Rights Project. Kim said the company will similarly support local causes, mentioning Bay Area Girls Rock Camp. 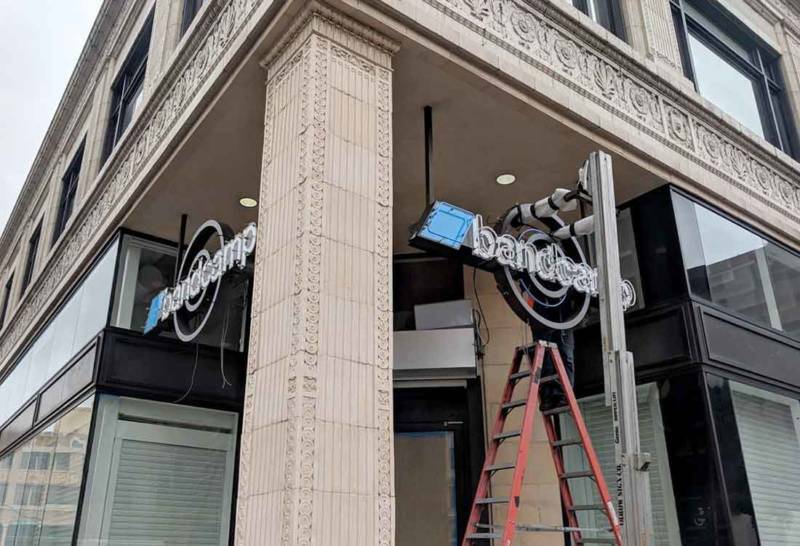 The grand opening party, on Feb. 1, features Jazz on the Sidewalk, a band composed of Oakland School for the Arts students, as well as local hip-hop and indie-rock acts Queens D.Light, Sol Development and Bells Atlas. Beforehand, MJ’s Brass Boppers will lead a second line-style procession from the First Fridays street fair to the company’s front door, arriving around 7pm. Bandcamp, which launched in 2008, offers listeners the ability to stream, download or purchase a physical copy of a given release on one page, and artists and labels set their own price for each option (often free). There’s also a social element to the site via fan accounts, whereby users can receive notifications about new releases, leave comments, and peruse each other’s collections. The company, which has been profitable since 2012, takes a 10-15 percent cut of sales. (iTunes, by comparison, keeps 30 percent before further set-asides for publishers and labels.) According to the site, Bandcamp has directly paid artists more than $7.2 million in the past 30 days. Its all-time payouts recently surpassed $350 million. For artists leery of the middlemen between them and Spotify or Tidal, which are often criticized for paltry payouts, Bandcamp is a go-to service. Similarly to how some rappers are synonymous with Soundcloud, indie-rock and underground punk and metal are closely associated with Bandcamp. (To wit, in 2017 a meme satirically contrasted the respective aesthetics of each service’s users.) Legacy indies such as Sub Pop and Dischord have label accounts, and the site is central to the breakout bedroom-songwriter narratives of Jay Som and Car Seat Headrest. In 2016 the company hired several writers to staff its blog, the Bandcamp Daily, which offers positive coverage of artists on the site. The Daily staff will remain in New York, but the Bandcamp Weekly, a radio show hosted by former Ubiquity Records A&R Andrew Jervis, will be recorded at the Oakland office. (This writer contributed to the Daily between 2016-2018.) The forthcoming video series, recorded on-site, will further bolster the site’s promotional infrastructure. To local label operators, who often lament music media’s concentration in New York and Los Angeles, Bandcamp’s arrival in Oakland is seen as a networking opportunity. Kim mentioned an upcoming all-staff gathering at the office, plus a visit from staff at Sub Pop. Sexton also emphasized that she doesn’t want to compete with local record stores. “We’re actually going to produce a map of all the record shops in town to give to visitors,” she said. Andrew Lopez of Father/Daughter Records—one of few Bay Area labels to consistently expose local indie-rock signees to wider audiences—said the label’s Bandcamp does more business than its official webstore. For many independent releases, a Daily feature is the publicity equivalent of placement on a popular Spotify playlist. Lopez said he recently heard from Sexton about ordering physical Father/Daughter titles for the record store, a level of outreach he’s never experienced with, say, Pandora.